Disclosure: I was invited to the Great Mall to participate in a summer shopcation day. Although I received coupons and gift cards to facilitate my review, all of the shops we visited, the movie we saw and the food we ate was of our own choosing. All opinions are honest and our own. It's official - summer is here! The kids are out of school, (most) college students have returned home to their families, the wedding invitations are pouring in and you're finally requesting days off from work. Since my daughter is still living on campus I don't get to see her as often as I'd hoped. With our busy summer schedules and summer vacation trips already planned - we wanted to do something fun, low-key and enjoyable while not breaking the bank or having to run out of town. Our plan? Go see "Finding Dory". But where? That's when the Great Mall, the largest outlet, entertainment and dining destination in Nor Cal, came into play. With her 19th birthday just a week away, we decided this would be the perfect chaos-free mother / daughter day. 1. Entertainment: We started at the 20-plex Century Theaters where we watched "Finding Dory" in Digital 3D. The movie was very cute! The theater is a large venue with multiple concession stands - which I appreciate. Side note: the popcorn is gluten free and cooked in canola oil. Thank you! 2. Shopping: Let's face it - shopping and talking are two of life's greatest pleasures. I loved being able to catch up with her while also browsing and picking up some needed items, and she loved that all her favorite stores were under one lovely air conditioned roof. From Forever 21 and H&M to Coach and UNIQLO - we were able to find great pieces at a great value. For my runners: there's a Nike store by a Puma store that's by an Adidas store. Need I say more? 3. Sales: Great Mall retailers prices are already discounted by 70%, but in addition to those savings the mall also has sales! The 4th of July Super Sale is a three day deep discount extravaganza taking place July 2 - 4th. 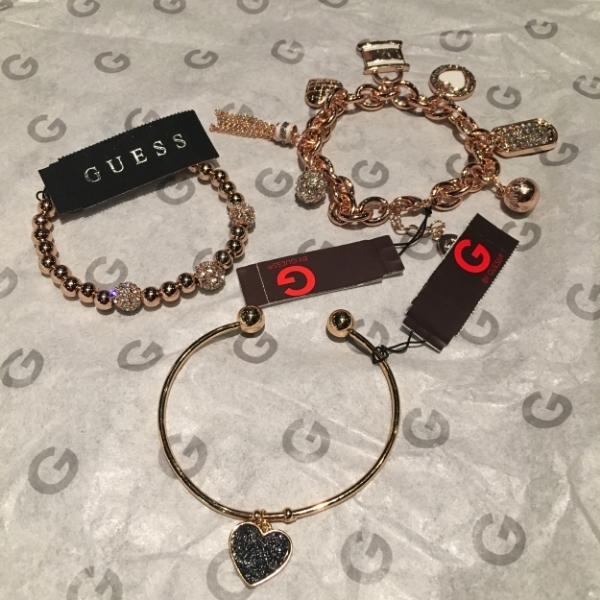 These 3 pretty bracelets from Guess only totaled $20 - and that's without a sale! We were really happy with the prices we paid for wedges, sneakers, pants and accessories at stores like Nike & Papaya. 4. Play: If you have little ones and want them to have fun too - the Great Mall has you covered. The movie theater has early shows that are more affordable and perfect for families who want to start the day with a fun movie. Afterwards, you can check out the inflatable slides and jumpers at Bounce-A-Rama or go to Dave & Buster's like we did! You can watch a baseball game, play video games AND eat. Either way you win! 5. Food: The Great Mall is home to a massive food court as well as larger anchor restaurants such as Dave & Buster's, Red Robin, Outback Steakhouse (NoTwitterTodd's favorite) and Olive Garden. In addition to that, a really fun food truck festival takes place every Thursday night. The fun outdoor food party features lives music and 9 food trucks from Off the Grid. The weekly line-up varies and include favorites such as Paddy Wagon Sliders and Los Tolucas. Definitely worth checking out.